As I stand here to deliver the Convocation Address for the third time in Himachal Pradesh University, I notice the same exhilaration and excitement in the students. Convocation day marks the completion of an extremely important phase in the life of an individual. I congratulate all the students who have received their degrees today. Today’s youth, having had the privilege of being educated in a free nation, has great capability. Our youth must understand that being in a democracy, it not only enjoys rights but also carry responsibilities. 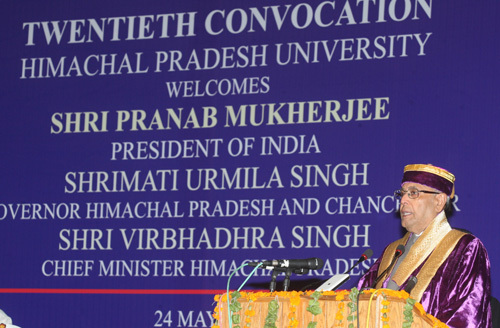 Himachal Pradesh University, established in 1970, has made its mark as an important centre of higher learning in the Northern Region. Twenty nine departments, eighteen specialized centres, and an International Centre for Distance Education and Open Learning underline the expanse of this University’s education programme. It is gratifying to note that this University is giving a serious thought to the introduction of a choice-based credit system that will act as a medium for knowledge convergence. To strive towards greater intellectual and socially relevant learning, this University has prepared a Vision 2020 document. I am confident that the entire Himachal Pradesh University community will continue to work with dedication and commitment to take it to greater heights. Education is a necessary tool for national progress, human empowerment and social change. The rising incidents of crime against women and children call for effective measures to ensure their safety and security. It also underlines an immediate need to arrest the moral decline in our society. We must find answers for reversing the degradation of values. Our universities have the capability to shape the minds of the youth. These temples of higher learning must act as guides in meeting the contemporary moral challenges and ensure that our civilizational values of love for motherland; performance of duty; compassion for all; tolerance for pluralism; respect for women and elderly; truth and honesty in life; discipline and self-restraint in conduct, and responsibility in action are fully entrenched in the young minds. A nation’s development is dependent in a large measure on its educational status. Our strategy of high economic growth is to overcome poverty and ensure development for all. We have to make economic growth relevant for our people, especially those at the bottom of the socio-economic pyramid. Distributive justice, as a higher goal of democratic polity, can be achieved only through a sound education system. India’s demographic structure is changing, and by 2025, over two-third Indians is expected to be in the working age category. To gain from this transition, our youth must be prepared through quality higher education and vocational training. Quantity and quality factors in our higher education system continue to challenge us. The higher education infrastructure in our country comprises over 650 degree awarding institutions and over 33,000 colleges. Despite this, we are short of good quality institutions to meet the increasing demand. We need quality education to be imparted to the manpower of tomorrow. The National Knowledge Commission had remarked about the falling standards in higher education as a ‘quiet crisis that runs deep’. For about eighteen hundred years, from 6th Century BC to the beginning of 13th Century AD, Indian universities like Takshashila, Nalanda, Vikramashila, Valabhi, Somapura and Odantapuri had dominated the world education system. Takshashila became the meeting point of four civilizations – Indian, Persian, Greek and Chinese – and was frequented by legendary personalities like Chandragupta Maurya, Chanakya, Panini, St. Thomas, Faxian, Charaka and Democritus. With focus on efficient management, these ancient universities became the colossus of the famed Indian higher education system. But today, our universities are no where in the top global rankings. We have the capability to revive our leadership position in higher education. For that, we must strengthen our drive to effect innovative changes to develop our universities into world class academic institutions. A culture of excellence should be promoted by allowing adequate flexibility in different aspects of academic management. Our colleges enrol 87 per cent of the higher education students. The affiliating universities should, therefore, take utmost care in monitoring and guiding these colleges on curricula and evaluation. Our universities should make increased use of technology solutions like e-education to address the problems of accessibility, quality and faculty shortage. Using e-classroom technology, important lectures can be transmitted to students in different locations. The National Mission on Education through Information and Communication Technology can assist in such collaborative information sharing efforts. Institutes of higher learning are absent in many parts of our country denying many good students the opportunity to acquire higher education. Its consequences are disturbing. India’s higher education system is the second largest in the world but her enrolment rate for the 18-24 years age group is only 7 per cent. Compared to this, it is 21 per cent in Germany and 34 per cent in the US. Greater access to higher education, especially in remote areas, is the need of the hour. Accessibility and affordability are necessary steps for inclusion. To make higher education affordable for meritorious students belonging to socio-economically difficult backgrounds, measures like scholarships, student loans and self-help schemes are necessary. We must prepare our graduates to compete with the best in the world. For that, they must be equipped with life skills such as self-awareness, empathy, creative thinking, problem-solving, effective communication, inter-personal relationship, and stress and emotion management. These skills are important for a healthy development of an individual, and should find due place in our academic curriculum. Availability of quality teachers in academic institutions is paramount. Our higher education institutions are short of good faculty. This may hamper our efforts at quality improvement. Hence, we must place top priority in filling up vacancies and also building capacity in our teachers. The famous poet, William Butler Yeats had said, (quote): "Education is not the filling of a pail, but the lighting of a fire” (unquote). We need inspired teachers who can shape the thoughts of the young minds. Through words, actions and deeds, such teachers inspire the students and elevate them to a higher level of performance and thinking. They enable their students to appreciate a subject from a wider perspective. They help to inculcate good values in their students. Our educational institutions must recognize such inspired teachers and encourage them to share their knowledge, wisdom and philosophy with larger number of students. Innovation is the key to future economic progress. China and the US are at the forefront of innovation with over 5 lakh patent applications each, filed in 2011. India, with only 42,000 patent applications, lags behind these leaders. We lack the systems to encourage and generate innovation. We must strengthen measures such as inter-disciplinary and inter-university research partnerships, research fellowships and industry incubation parks. We must develop key research expertise. We must put in place a system to attract Indian researchers working abroad to work on short-term projects in our country. This decade has been declared as the decade of innovation. This should carry meaning for the common man. There are grass root innovations that require technological and commercial mentoring for developing them into viable products. In a Conference of the Vice Chancellors of Central Universities held this year, a recommendation was made to set up Innovators Clubs in the Central Universities to facilitate interaction between the teaching and student communities and grassroots innovators. Recently, I had the occasion to open such clubs at two Central Universities in Uttar Pradesh and Assam. In innovation exhibitions organized by these universities and the Nagaland University, I was pleased to see the technologies that have been developed by the grassroots innovators. I invite you to join this festival of innovations in our country. I once again congratulate all the students who have completed their formal education in this University. Please remember that there is no end to education and learning. Opportunities to learn will unfold before you at every stage of your life. You must have an open mind to be receptive to such knowledge. You must overcome challenges in life by your sincerity, dedication and hard work. I wish you all the best in life and career. I also wish the management and faculty of Himachal Pradesh University all success.